Petersen performed with scores of highly regarded musicians, starting in 1957 when he toured Europe with the Hal McIntyre Orchestra and became an in-demand studio musician. At 82, he’s still known for his inventive ability to reinvent chord progressions — and his clever wit. 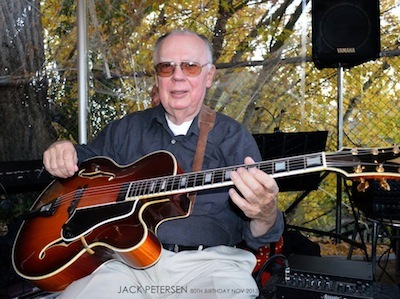 Petersen is considered the architect of guitar labs at three institutions of higher learning, as the first fulltime guitar teacher at Berklee College of music (1962-65), guitar artist-in-residence at the University of North Texas College of Music (1976-1988) and resident artist-associate professor at University of North Florida (1988-1995); he moved to Prescott in 2003.